Despite the bad rap Mondays get, I tend have so much more motivation and drive on a Monday than I do most of the rest of the week. On Mondays, I realize all the ways I messed up the previous week and resolve to make the new one better. Making my meal plan is a great way to attempt to rectify my wrongs (as one of my major mess-ups is usually my diet.) Since I have this new resolve, I decided to start planning snacks and some desserts for the week in addition to our other meals in an attempt to make those a little more healthy too. Here's what's in the works for this week. I'm linking up this meal plan for Menu Plan Monday at I'm an Organizing Junkie. Cauliflower Chowder: I know this is a chowder, but it was a tad chunky for my taste so I blended it down just a bit with an immersion blender. We both really enjoyed the soup, though we didn't touch the leftovers. Despite that, I will possibly make it again. Bucatini pasta with mushrooms: This is about the 4th time I've made this dish. I simply love it! Chicken Pot Pie: This was easy and versatile. I used a pre-made pie crust instead of the homemade one because I already had the pre-made one in the freezer. As for taste, it was good though I felt like it was lacking just a little something. I might make it again, next time with the yummy homemade crust. This past week I made some granola to add to yogurt for breakfast. Beyond breakfast, granola also proves to be a great snack or dessert topping. As well, you can put in so many different combinations of ingredients that it suits most any taste. 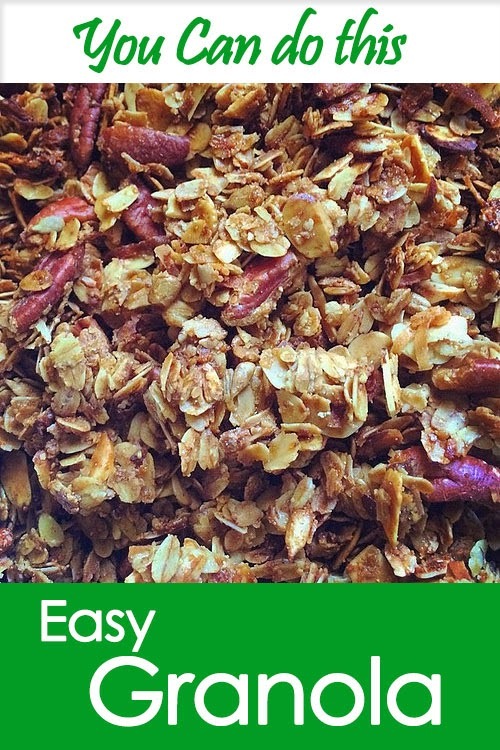 I've shared this granola recipe before but thought it was about time to break it out again. ~Combine oats, nuts, seeds, salt, brown sugar, and cinnamon in a large bowl and stir together. ~Add oil, maple syrup, honey, vanilla, and coconut. Mix well. ~Cover a baking sheet with aluminum foil and spray it with cooking spray. ~Spread mixture evenly onto sheet and bake for 30 minutes, stirring halfway through baking time. ~Remove from oven and cool. ~Store in an airtight container for several days. *Other ingredient options include up to one cup of dried fruit or some chocolate chips. I usually just make half a recipe for the two of us. My mix of seeds and nuts changes every time. In the pictured granola, I used pecans, sliced almonds, sunflower seeds, and ground flax seeds. Added plus, your house smells great! This post has taken more time than I imagined, so it's time to be off and on to something else. What kind of healthy snacks do you recommend? That granola looks yummy! I found this post via Tumblr. It does not appear in my blog reading list for some strange reason. Glad I found it! I made granola for myself for the first time a few months ago and was surprised how good and easy it was. My son loves it, and it's so expensive at the store. By making it myself, I can also adjust what I like and don't like (like coconut!!! Or raisins! Why do people ruin good food with raisins?? - hahaha!) Anyway, this is a great recipe I will certainly try next time - minus the coconut! Yummy granola. Thanks for the inspiration.